If you had over $3,000 to spare, what would you do with it it? Component vendor OCZ Technology hopes that you'd spend it on one of its new, massive 1TB Colossus Series SSDs. The 3.5-inch drives, which come in a sleek lightweight aluminum design, were originally expected earlier this year, but were delayed for undisclosed reasons--until now. 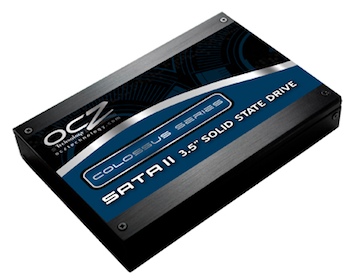 OCZ's Colossus Series SSDs are available in a variety of capacities, starting with a $550 120GB model. Colossus Series drives are also available in 250GB and 500GB capacities, with the top-end model offering 1TB of storage. The 1TB Colossus drive is the first solid-state drive (SSD) to pack in such a high capacity. However, the luxury of speed and space comes at an extreme price, with the high-end model costing a massive $3,300. That said, despite the immense price tag, PC Perspective deems the SSD a worthy contender, commending its impressive read and write speeds. You can check out the Colossus Series' full specs on OCZ's official site.